Homeowners have given us superior ratings for satisfaction and customer service, making us highly recommended in Amarillo. 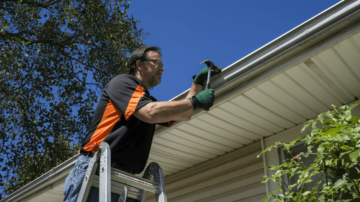 We offer the most complete continuous gutter services in the Panhandle, from installation to repair and rain water storage. Our rain gutters come in over 30 colors and a variety styles and materials so that they can be customized and matched to fit your home. Home Advisor™ has given us their seal of approval after verifying state licensing, conducting background checks and researching legal filings. We are committed to doing the best work on your home or business. Our owner will be on every job ensuring quality work that you can trust. Fence staining protects and extends your fence investment for years ahead. Restoration is vital to keep the wood’s structure and natural beauty. Gutters bring out a home’s features while adding curb appeal. Gutters will help funnel water to a better, more adequate location to evacuate water from the homes' foundation. 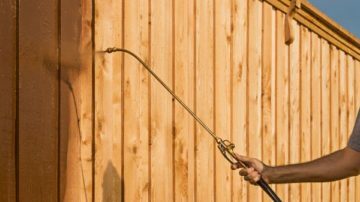 Fence staining protects against wood warping by acting as a layer restricting the absorption of moisture. Continuous Gutters or Seamless Gutters offer a stronger/better material for moving water off of the roof to a optimal location. Over a 50' span, continuous gutters take away 4 potential leak joints that sectional gutters would have. 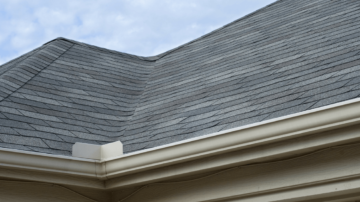 During the late summer/early fall, leaves fall onto the roof and collect in the gutters. This inhibits the drainage slope of your gutters and causes overflowing. Leaf guards let water into the gutters, but keeps the leaves out. 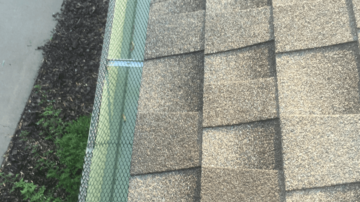 NVES can repair/replace sections of gutter that have fallen off of their hangers, been hit by basketballs/soccer balls, or that were installed incorrectly. 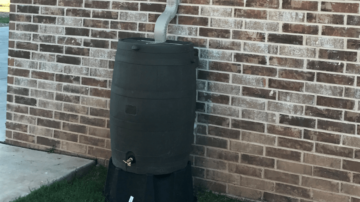 Rain Water barrels are placed under a convenient down spout and harvest nutrient enriched water for the watering of plants and gardens. We offer the barrel and stand and a garden hose can also be attached to the spigot. 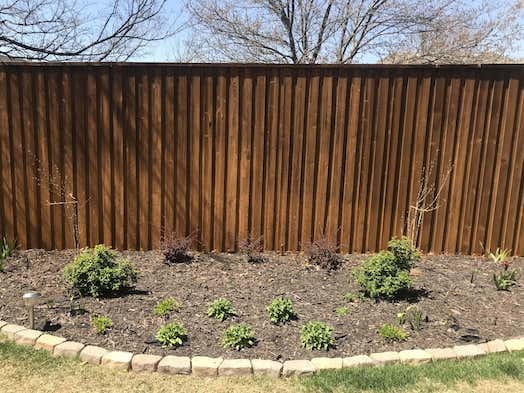 New Vision’s fence staining service can restore old, grey and weathered fence back to its brand new attributes without harming, splintering or warping your fence. Looking for high quality and affordable gutter installation or fence staining? New Vision Exterior Solutions specializes in residential, new construction and commercial seamless rain gutters and fence staining. We take pride in quality craftsmanship, curb appeal and most of all, function. We've completed continuous gutters for townhomes and condos. New Vision Exterior Solutions was founded on the values of pride in craftsmanship and that is our mission. We enjoy the “wow” factor our clients experience when they see the final touches placed on their homes and are overjoyed with the curb appeal that has just been added. That keeps us going and doing great work! We offer free estimates and try our best to get the estimate to the potential customer as quickly as possible. Our materials have many colors and styles to choose from with color quality, corrosion protection and fade resistance. We use 27 Gauge material as opposed to those used by some competitors and box stores. We put up all gutters that we run out of our machine and ensure correct installation of gutters and downspouts. The customer will enjoy having the turnkey install. Compared to installing a new fence, our fence staining services are more cost-effective. Plus staining typically only takes a single day. We are an owner-operated rain gutter installation and fence staining company headquartered in the greater Amarillo TX area. We serve the entire Texas Panhandle with rain gutter and fence staining services. 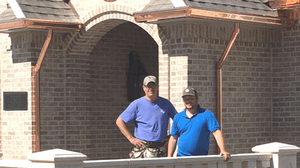 We do high quality seamless gutter installation and fence staining in Amarillo and nearby areas like Bushland, Canyon and Lake Tanglewood, serving both Potter and Randall counties. © 2016 New Vision Exterior Solutions. All rights reserved.